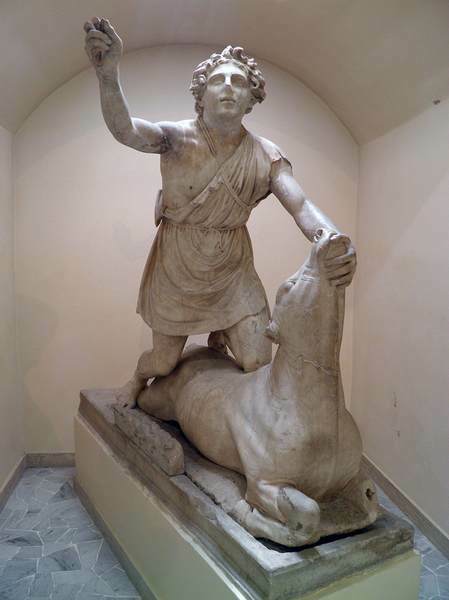 Mithraism was a mystery cult in the Roman world where followers worshipped the Indo-Iranian deity Mithras. The Mithraic Mysteries, also known as Mithraism, were a mystery cult in the Roman world where followers worshipped the Indo-Iranian deity Mithras (Akkadian for “contract”) as the god of friendship, contract and order. The cult first appeared in the late 1st century CE and, at an extraordinary pace, spread from the Italian Peninsula and border regions across the whole of the Roman empire. The cult, like many others, was a secret one. Votaries (i.e. 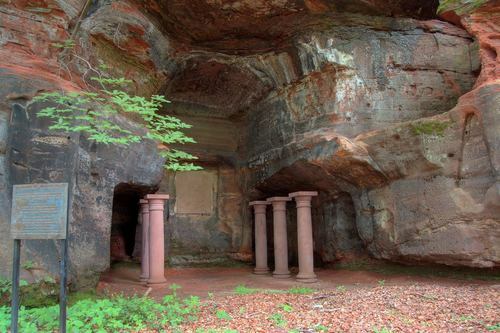 followers of the cult) worshipped Mithras in temples often built into caves and hidden away from the public. This was done so as to create the feeling of being part of a special group, just like a close group of friends that does not share secrets with outsiders. However, the secrecy of the cult was tolerated by the authorities, especially by the Roman emperors, because it was in favour of imperial power. 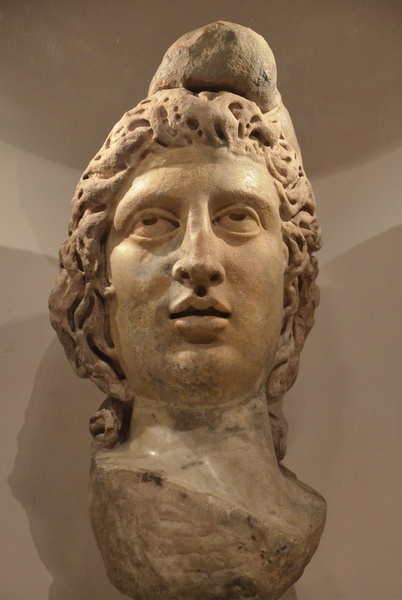 Over 200 Mithras temples have been found, stretching from Syria to Britain, but finds are concentrated mostly in Italy, on the Rhine, and the Danube. After the crisis of the 3rd century CE and the establishment of Christianity, the Mithras Mysteries diminished in importance as temples were walled up or destroyed by Christians. However, some temples remained in use until the early 5th century CE. The most important element of the myth behind the Mithraic Mysteries was Mithras’ killing of a bull; this scene is also known as “tauroctony”. It was believed that from the death of the bull – an animal often seen as a symbol of strength and fertility – sprung new life. Rebirth was an essential idea in the myth of Mithraic Mysteries. The sacrifice of the bull established a new cosmic order and was also associated with the moon, which was also associated with fertility. What is special about the Mithraic Mysteries is its visuality. The sacrifice of the bull was depicted in a stone relief that had a central place in nearly every cult temple. In the relief, Mithras is often shown as he wrangles the bull to the ground and kills it. Being a Persian god, Mithras wears what Romans believed to be typical “Persian Chic”: the Phrygian cap and pants, which Romans did not wear. Around 650 of these stone reliefs have been found, and they are all strikingly similar. In a typical example, such as the celebrated sculpture from the Roman-Germanic Museum in Cologne, Mithras looks away from the dying bull, up to the moon. In addition, Mithras has a few helpers that assist him in taking the bull’s fertility: A dog and a snake drink from the bull’s blood, and a scorpion stings the bull’s scrotum. Also, a raven sits on the bull’s tail that typically ends in ears of grain. The raven could have played the role of a mediator between Mithras and the sun god Sol invictus, with whom Mithras will share the meat of the bull. The bull sacrifice relief was typically placed at the end of the temple, which was essentlly built like a stretched-out Roman dining room – an aisle flanked by two broad, raised benches. However, the sacrifice of the bull was rarely enacted by the worshippers themselves. Worshippers did imitate how Mithras shared the bull’s meat with Sol, as fragments of dishes and bones of animals that have been found in these temples testify. High-quality pork, chicken and a large quantity of wine were consumed in high-spirited cultic feasts that connected the worshippers to each other and to Mithras. 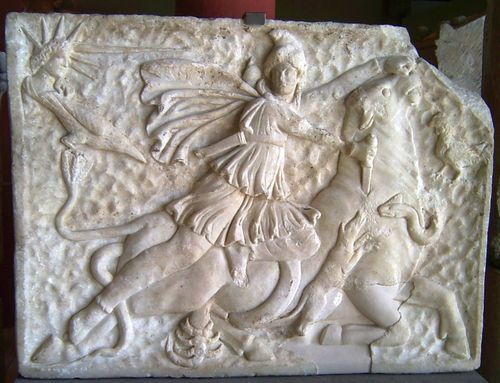 The Mithraic Mysteries were not just about fun and games, however. There were strict rules as to how the feasts were organised, for example, regarding hygiene. What is more, there were seven degrees of initiation, ranging from “corax” (raven) to “pater” (father), of which each had its own type of clothing. The other degrees were “nymphus” (bridegroom), “miles” (soldier) , “leo” (lion), “perses” (Persian), and “heliodromus” (sun-runner). Each degree of initiation had a different task to fulfill, e.g. a “raven” had to carry the food, while the “lions” offered sacrifices to the “father”. Also, the initiates had to take part in tests of courage. The paintings in the temple of Mithras at Santa Maria Capua Vetere show us different scenes of this ritual. An initiate, blindfolded and naked, is led to the ceremony by an assistant. Later, the initiate has to kneel before the “father”, who holds a torch or a sword in his face. Finally, he is stretched out on the floor, as if he had died. This probably was a ritual “suicide” in which the initiate was “killed” with a non-lethal theatre-sword, and was then reborn. Other important elements of the cult were self-denial and a moral questioning of the self. For example, as the Christian author Tertullian tells us around 200 CE, a crown was placed on the initiate’s head, which he had to reject, saying “Mithras is my (true) crown” (Tertullian, De corona milites 15). This too was thought of as a ritual of reincarnation, which started a new life for the initiate. The earliest documented followers of Mithras were soldiers and officers of the Roman army, but with the rising popularity of the cult, the majority of votaries were successful, freed slaves of the cities. Women, however, were excluded. Why would a Roman soldier, or anyone, go through these troubles to become a member of a Mithras Mystery? First, as mentioned earlier, the cult supported the emperor, unlike other cults, such as the Bacchanalia. Second, the cult was based on mutual interest, friendship, and intimacy. The temples accommodated only small groups. It is understandable that members of the military were attracted by these aspects that guaranteed some sort of stability in an otherwise dangerous profession. There are three different views on how the Mithras Mysteries became a cult in the Roman and Hellenistic world. Roman and Greek historians of the 2nd and 3rd century CE thought that the cult had originated “in Persia” or “with the Persians”, and early research often followed this interpretation. However, the archeological findings do not substantiate this view: most Mithraic temples have been found in Italy and the provinces of the Danube, not Persia. What is more, the cultic reliefs depict Mithras display what Romans thought of as typical oriental clothing, but show little originality. This is comparable to modern stereotypes of all Germans wearing leather pants, or all Americans wearing cowboy hats. A second view is that the original, oriental Persian Mithraism mixed with Roman-Hellenic culture to transform into a new form of cult. While this theory of transformation is tempting, the problem remains that in the border region between the Roman-Hellenic and the Persian world where this merging would have taken place, there are little findings of Mithraic worship. The bottom line is that there are too little sources to form a certain explanation of the cult’s origin, and there are many blank spots. Besides the many visual artifacts of the Mithraic Mysteries, little written sources remain. There are only descriptions written by Christian authors, who, perhaps, were not exactly fond of the Mithraic competition. In the eyes of church father Hieronymus, for example, Mithras temples were places that were best destroyed. No written sources by members of the Mithras Mysteries survive, but this makes sense, keeping in mind that it was a secret cult. Perhaps the focus should not be so much on finding a single root of the cult. Rather, we should take a dynamic approach. Figuratively speaking, we should take a close look at the different branches of the Mithraic Mysteries at different places, and the different periods of time, or “seasons”, at which this fascinating cult existed. (Cf. Witschel 2013: 209). 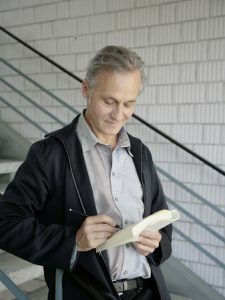 Christian Witschel. “Die Ursprünge des Mithars-Kults. Orientalischer Gott oder westliche Neuschöpfung.” Imperium der Götter, (edited by Badisches Landesmueum Karlsruhe). (Badisches Landesmueum Karlsruhe, 2013), 480. This entry was posted in Ancient, History, Religion, Roman, Rome. Bookmark the permalink.